The sixth "South East Asia Peace Initiative" program. Dr. Robert Kittel, Kathmandu, Nepal December 2, 2000. Nepalese leaders from three major political parties along with the president of the Human Rights Organization and a former Indian Ambassador to Nepal found common ground as this Himalayan nation treks to the summit of a new, inclusive, democratic Nepal. 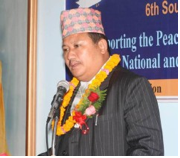 In strong, passionate speeches at the Sixth South Asia Peace Initiative (SAPI) program, senior leaders of the Communist Party Nepal (Maoist), Nepali Congress, and Communist Party Nepal (UML) reaffirmed their parties' commitment to holding elections as soon as possible, creating a constitutional assembly, and making Nepal a republic. They were also appreciative of the support of Universal Peace Foundation in the ongoing peace process. At the outset, Mr. Ek Nath Dhakal gave an overview of the history of SAPI to the 120 distinguished guests. He outlined the numerous programs of UPF, which included conferences, rallies and marches as well as the World Peace Tours of the UPF Founders, Father and Mother Sun Myung Moon from Korea. The close correlation between the peace process and the SAPI programs over the past three years was especially emphasized. Former Indian Ambassador to Nepal, Mr. K.V. Rajan, said that Nepal is doing something no other nation on earth has done. In the matter of a few years this nation is transitioning from feudalism to full-blown democracy, opening the way for a left-wing radical party to join mainstream politics, and working to create a federal government and an inclusive political structure. The Indian diplomat noted that the role of the international community was to understand, empathize with, and support this historic process, without underestimating the capacity of the people and political leaders of Nepal to resolve their own problems. The president of the Human Rights Organization of Nepal, Mr. Sudip Pathak, made two novel suggestions during his 15-minute address. Most important, he said, was that "civil society must establish a code of conduct [for the nation of Nepal]." He emphasized that this cannot be done by any political party because vested interests could not be ruled out. Mr. Pathak also called for "peace volunteers" at the village level in every district of Nepal. The importance of bringing an early resolution to the political crisis was stressed by Mr. C.P. Gajurel of the Nepal Communist Party (Maoists). "Without solving our political problems," he said, "we cannot focus on economic development." Mr. Gajurel insisted that Nepal should be immediately declared a republic and that proportional representation be part of the process. The possibility of more violence, if the peace process fails, was raised by Mr. Krishna Gopal Shrestra, leader of Communist Nepal Party (UML). Special guest, Mr. G.M. Gurung, Minister of the Government of Sikkim, Ministry of Human Resource Development and Cultural Heritage, won everyone's hearts. He dressed in a Nepalese national uniform which he bought the day before after arriving in Kathmandu. Mr. Gurung said he came not as political figure holding a government portfolio, but as a friend of UPF. Concluding his remarks he invited UPF to Sikkim and said he would help organize a similar event in Gangkot, the capital. At the beginning of the program, UPF's philosophy of peace was shared with the 120 delegates present. Dr. Robert Kittel, Director of Peace Education for UPF-Asia, explained that people cannot be policed into being good. Instead, people have to be guided by their conscience. In order to strengthen their inner compass, people must find a common understanding of what is good. According to the UPF philosophy, a universal definition of goodness is sacrificing oneself in order that others may benefit. This becomes even more obvious by looking at the opposite—evil—which is sacrificing others for personal gain, something that is condemned universally.